In the opening scene of The Last Picture Show (1971), directed by Peter Bogdanovich, it appears as if gunshots are echoing through the empty dirt streets of Anarene, Texas. But it is only the backfiring of Sonny Crawford's (Timothy Bottoms) truck, and the viewer is forewarned that though this may look like a frontier town, right down to the tumbleweeds, it no longer has the energy to give rise to a gunfight. The stores are boarded up, the highway sign to Routes 25 and 79 points to the way out, and the Royal, the town's theater, is showing its final movie, Howard Hawks's Red River. The year is 1951, and Sonny and his best friend, Duane (Jeff Bridges), have just lost their last football game, and, like other teenagers in Anarene, they have no idea what to do with their lives. The adults offer no model: there is Ruth Popper (Cloris Leachman), the aging and lonely wife of the boorish coach who finds respite from despair in the arms of Sonny; there is Lois Farrow (Ellen Burstyn), rich and bored and worried that her daughter– the self-centered and manipulative Jacy (Cybill Shepherd)–is following in her footsteps; there are nameless old men who aimlessly gather at the pool hall, its air heavy with dust and tedium; and everywhere there are open secrets and unmentioned infidelities. Only the dignified Sam the Lion (Ben Johnson), a former cowboy and now the theater owner, is a reminder of a more vibrant past. But Sam dies, the movie house closes, Duane heads off to Korea, and Sonny is left with no prospects in this atrophied place. Director Peter Bogdanovich audaciously (by 1970 nearly all feature films were in color) shot the film in black and white on location in Archer City, which, like the fictional Anarene, lies just to the southwest of Wichita Falls. Bogdanovich and Larry McMurtry wrote the Academy Award–winning screenplay, which was adapted from McMurtry's 1966 novel of the same name. (The screenplay is a less bitter though no less desolate view of McMurtry's hometown of Archer City.) The music of Hank Williams, Hank Snow, and Bob Wills and the Texas Playboys, among others, confirms the time and place. With its unhappy marriages and failed lives, the movie could easily have degenerated into a soap opera, but Bogdanovich's skilled, unobtrusive direction and the superb cast of actors–both Ben Johnson and Cloris Leachman won Oscars and Ellen Burstyn won a New York Film Critics Award for their supporting roles–ensure the authenticity of this sad, elegiac portrayal of the dying days of a Great Plains town. See also CITIES AND TOWNS: Small Towns / LITERARY TRADITIONS: McMurtry, Larry. 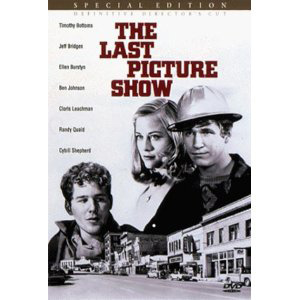 Dawson, Jan. "Review of The Last Picture Show." Sight and Sound 47 (1972): 107–8. Lorenz, Janet E. "The Last Picture Show." In International Dictionary of Films and Filmmakers, edited by Nicholas Thomas. Chicago: St. James Press, 1990: 1: 497–99.